This new, plain language booklet for Aboriginal peoples explains how to prepare a Gladue submission to help the judge decide bail or sentencing. Includes a Gladue factors checklist and a worksheet to help Aboriginal peoples, lawyers, and Native courtworkers gather information needed to prepare a submission. This revised booklet explains Gladue rights, rights under the Criminal Code that apply to anyone who identifies as Aboriginal. Gladue rights can apply at bail and sentencing hearings. This updated booklet is for permanent residents who need help when the person sponsoring them in Canada is no longer supporting them. Chart shows possible stages and orders in child protection proceedings under the Child, Family and Community Service Act, with notes – statute sections are hyperlinked to the Act. Stages in a Criminal Case: These notes provide more information about criminal procedure – the procedures set out in the Criminal Code of Canada to be followed in criminal cases. General information about the Provincial Court and the BC justice system. Are you a senior representing yourself in a Small Claims Court proceeding? Call 604-336-5653 to find out more about this Trial Preparation Clinic. A lawyer will call you back to assess if the clinic is able to assist. This updated booklet is for service providers assisting “mothers without status”. It now has new content on MCFD and has been updated for immigration and Family Law Act changes. 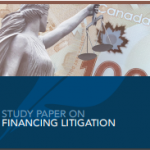 The paper reviews six financing models to pay for litigation: unbundled legal services, third-party litigation funding, alternative fee arrangements, crowdfunding, legal expense insurance, and publicly funded litigation funds. It also discusses 18 ideas on how to enhance the use of each model. Mental health detentions in BC have increased dramatically over the last ten years. This report reveals several disturbing practices and points to a number of deep flaws in the BC Mental Health Act that do not comply with the rights guaranteed by the Charter and international human rights law. 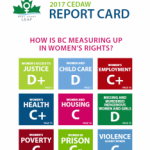 The annual CEDAW Report Card grades BC’s compliance with United Nations Convention on the Elimination of All Forms of Discrimination against Women (CEDAW). BC’s record of action and inaction in the past year is assessed in nine key areas impacting the rights of women and girls. This guide is for self-represented litigants (SRLs) who are also people with disabilities (PWDs). It provides information on disability accommodations and resources in the justice system. It includes a list of organizations that may be able to help. This guide helps self-represented litigants (SRLs) with reading case reports. It gives advice to SRLs on how to read and use case law in their legal research and is a companion to the CanLII primer. It also includes a glossary of important terms and a list of court abbreviations. Charterpedia provides legal info about the Charter and contains information about the purpose of each section of the Charter, the analysis or test developed through case law in respect of the section, and any particular considerations related to it. Each Charterpedia entry cites relevant case law. The final results of survey of participants from a 2-day national symposium with a multidisciplinary spectrum of leading stakeholders to share info & dialogue about how: voices of children and youth are heard, their interests are protected & evidence is received in justice proceedings. A review of the development of parenting coordination in the US & its adoption in Canada, and the findings of the research available to date on parenting coordination, its efficacy in resolving parenting disputes, its efficacy in steering such disputes out of court & its impact on parental conflict.